The villa provides a spacious open plan living area with two large sofas, one of which converts into a Queen bed. There is a large flat screen TV with cable (including Starz and HBO channels), upscaling DVD, stereo CD player and BOSE SoundDock iPod/iPhone docking system. There is also a Playstation 3 MOVE system with various controllers and games (including Harry Potter). There is a fully equipped kitchen. 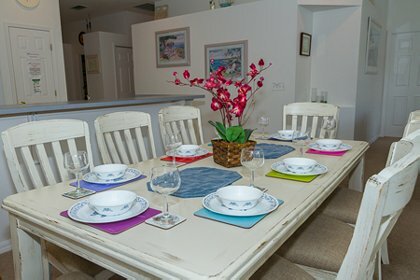 The dining area has an extending table and chairs seating up to 8 people. There are a further two stools which can be used at the adjacent breakfast bar. There is a utility area with full-size washing machine and dryer. 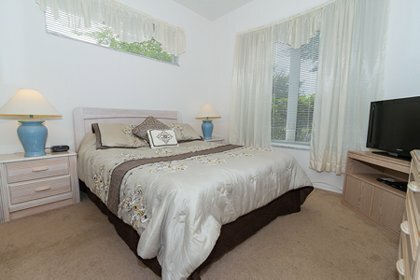 The master bedroom has a King size bed, a large en-suite bathroom and walk-in closet with electronic safe. Bedroom 2 has a Queen bed and adjoining Jack and Jill shower room/wc, shared with a twin bedded room. There is a further twin bedroom with a Mickey and Minnie theme. 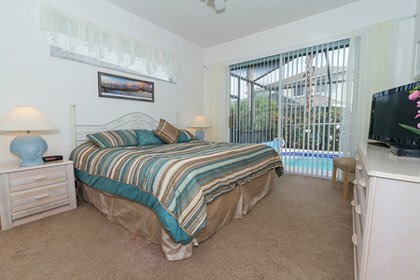 All bedrooms have cable TV with flat screen TVs and upscaling DVD layers. The third bathroom has bath and shower over, wash hand basin and w.c. There is also a Playstation 2 with two controllers and games in one of the twin bedrooms. All bedrooms have Sony iPod/iPhone docking radio alarm clocks. The Games Room contains a pool table & foosball/table soccer. It also has two sofas for lounging on. Three sliding doors lead directly onto the screened pool deck where you will find sun loungers and chairs to enjoy the Florida sunshine until late into the evening. There is a shaded lanai area that has an overhead fanlight and a table and chairs for outside dining. The pool area is extremely private being surrounded by mature hedging, and the heated pool has a cover to keep a comfortable temperature in the cooler months. Free crib/cot with linen, high chair, bed rail/guard and strollers. 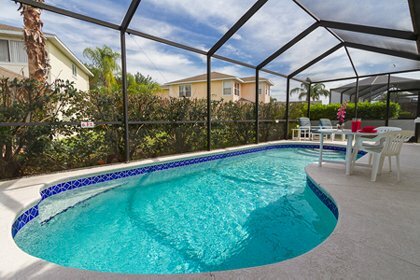 Luxury pool home in a secure gated community, less than 10 minutes to Disney! Secluded heated pool with plenty loungers to relax on. Pool cover for the cooler months. Spacious open plan living area with lots of entertainment options. Large table and chairs to seat 8 comfortably, plus two bar stool at breakfast bar. Luxury mattress topper for a great night's sleep. Large en suite bathroom with shower and 'Roman' tub. Twin room with large flat screen TV and upscaling DVD player. Our trip to Kissimmee has been a real success and a fantastic experience. every one of us and especially by our grandchildren. Also, we have appreciated very much the cooperation, the kindness and all the services from your local manager, a nice person who itÂ’s a pleasure to talk with. Your Villa is located in a very beautiful and quiet area and gave us the feeling we were living in a little paradise. 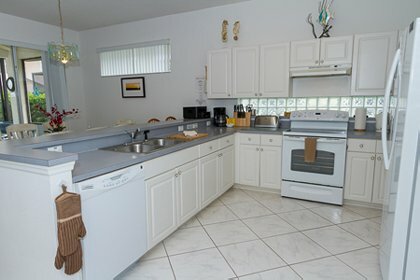 We had an absolutely fantastic time in Florida and staying in your villa was wonderful. 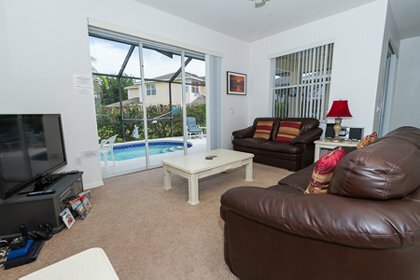 It was equipped with everything that you could possibly need and the pool was just PERFECT after busy days at Disney! Once again thank you so much for letting us stay in your holiday home. Thank you so much for responding so quickly to our last minute need for accommodation! 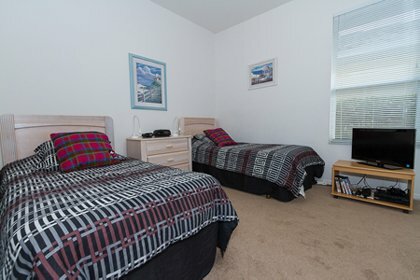 We had a wonderful stay and will recommend your home to all our friends! Beautiful clean villa with plenty of space and amenities.The villa is ideally placed for easy access to all the theme parks. The owners were helpful and responded promptly to all our queries and we would be more than happy to recommend this property to our friends, this was our third visit to the villa and we hope to stay there again in the future. 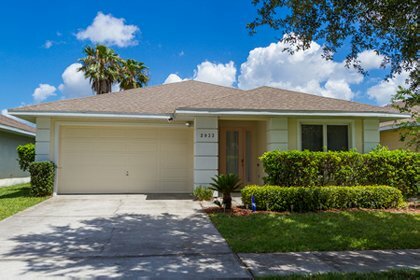 Kissimmee Vacation Rental Rate Information. Minimum 7 day rental period. $250/£150 deposit payable to secure a booking. Balance payable 8 weeks prior to arrival date. $300/£200 security deposit required. Security deposit returned within 4 weeks of departure assuming no damages. Pool heat extra $20/£14 per day (2014 $24/£15) Credit cards accepted through PayPal subject to 4.25% surcharge. Other conditions sent out at time of booking. Deposit: Deposit of £150/$250 required to secure booking. A security deposit of £200/$300 is required which is refunded following a satisfactory post-stay inspection. Cancellations and Refunds: In the event of the booking being cancelled by you the following charges will normally apply: 8 weeks or more -£150/$250 6-8 weeks - 50% of total rental charge. 4-6 weeks - 75% of total rental charge. Less than 4 weeks - 100% of total rental charge All cancellations must be in writing, by post or e-mail. In the unlikely event that circumstances beyond the owners control results in the cancellation of the booking the owner or their agent reserves the right to cancel the booking and be liable only to refund any monies already paid by the client.